"Alvvays goes shoegaze. Dreamily drift between featherlight fizz and gutting, rueful riffing." Having just wrapped up a successful run of Canadian tour dates, Hamilton outfit Basement Revolver are sharing their striking new video for "Baby" ahead of their October UK tour supporting Amber Arcades. 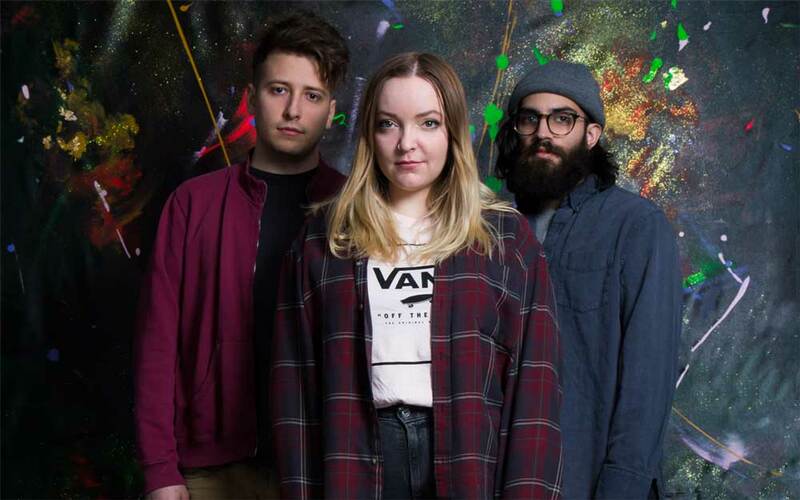 "Baby" was one of the lead-singles from their recent album Heavy Eyes, which came out last month via Sonic Unyon - the track made Amazon UK’s Week One, and was added to Apple’s Nightcap playlist as well as Spotify’s Indie Highlights. Album cut “Dancing” has made its way up CBC Radio 3’s Top 30, while the LP has been in Earshot’s Top 5 for several weeks. The trio of Chrisy Hurn (vocals, guitar), Nimal Agalawatte (bass, synth), and Brandon Munro (drums) hail from Hamilton and their ascent to the spotlight has been a steady trajectory. They were signed by Memphis Industries’ UK sub-label Fear Of Missing Out, who released their debut self-titled EP in 2016, which included breakout track “Johnny”, which is also a highlight of their debut full-length Heavy Eyes, which has garnered critical acclaim and support from CBC Radio 3, Campus/Community Radio across Canada, and BBC Radio 6Music. Assured yet open, beguiling yet honest, heartfelt yet playful. In a relatively short time, Basement Revolver have successfully encapsulated the yearning and hopefulness of their generation, whilst harnessing a unique, yet familiar soundscape.